When Gloucestershire Training Group (GTG) decided to expand into new purpose built premises in 2012 a rebrand was opportune. Prior to working on their new identity we had developed and designed a new website for them, however knowing that a rebrand was imminent, we ensured that the site was easy to re-skin. So the challenge was to devise a new brand identity, in line with their values as an engineering training association with charitable status. 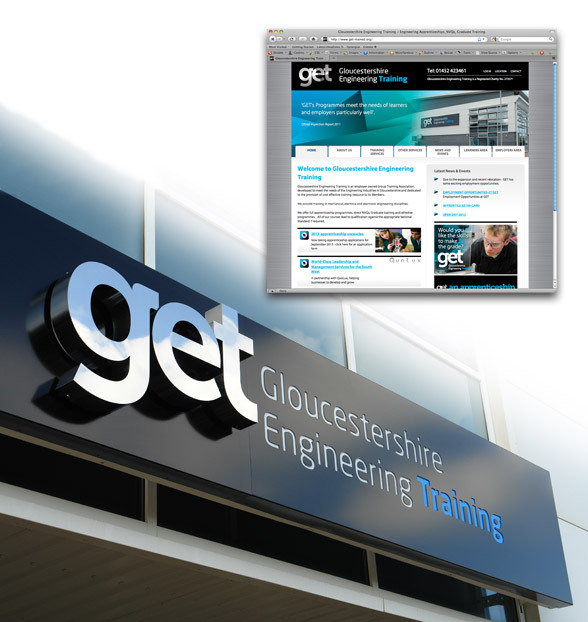 We held sessions with GTG to discuss variations of the new name, and we settled on Gloucestershire Engineering Training (GET). This name more accurately represented their specialism in engineering training and allowed us to use the catchy domain of www.get-trained.org. Once the name had been agreed upon we set about planning the external and internal signage, from the main business sign right down to the classroom signs and signage on doors. To suit the bold and fresh new look the external signage was backlit. We also commissioned some bespoke wallpaper to dress the reception area and create a great first impression. The new brand launch tied in with opening the doors to their new premises in Autumn 2012. The new look was well received and employees, students, and GET continue to do sterling work in developing workplace skills across Gloucestershire. The refreshed website is helping GET to communicate effectively with all stakeholders and has become a critical information platform.